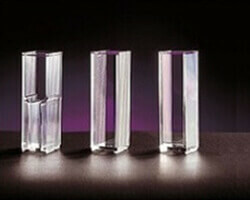 Glass Cuvettes & Flowcells are custom manufactured for size and application. Optical glass cuvettes or flowcells are utilized in spectrophotometry, fluorometry and automated chemistry analyzer applications. Glass material enables the easy cleaning and reuse of the cuvette or flowcell. Quantity pricing can be quoted from engineering prototypes through production volumes.